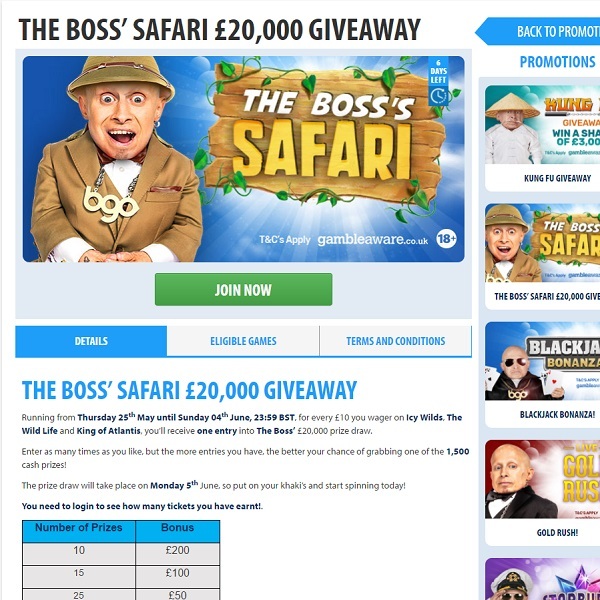 BGO Casino has launched a Safari Promotion that is giving away a total of £20,000 over the coming days. All you have to do is head over to the casino and for every £10 that you bet on Icy Wilds, The Wild Life and King of Atlantis slots you will receive one entry to the prize draw. There is no limit on how many entries you can earn so the more you have the better the chance of winning one of the 1,500 prizes. There are 10 prizes of £200, 15 prizes of £100, 25 prizes of £50, 40 prizes of £20, 480 prizes of £10 and 930 prizes of £5. You have until the end of Sunday to collect as many entries as possible so head over to BGO and start playing today and you could soon be a big winner.